string(1114) "Resource Centre > Uncategorized > Children’s Rights in Policies and Codes of Conduct"
This tool recommends ways for all businesses to incorporate children’s rights into their policies and codes of conduct, based on the Children’s Rights and Business Principles and reaching beyond the traditional focus areas of child labour and philanthropy. 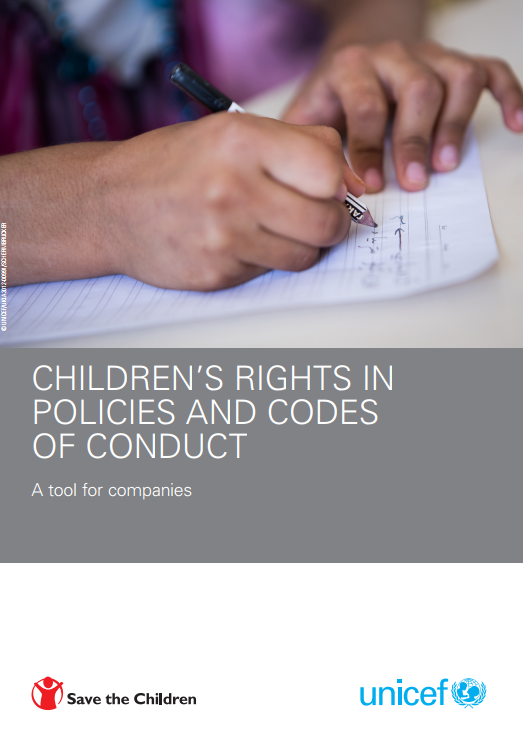 It outlines the children’s rights elements that are relevant to all companies, and is intended to be flexible and adaptable – including elements that companies can adopt and integrate as appropriate, based on their biggest areas of risk and opportunity. Although businesses do not necessarily have to develop a stand-alone child rights policy, it is important that all companies include a statement of their commitment to fulfill their duties on all human rights – including children’s rights – in their existing policies and codes of conduct and, when material, include policy elements and code of conduct provisions that address specific child rights impacts. ‘Material’ issues in a child rights context reflect the perspective of children as key stakeholders; they are considered in terms of the impact experienced by children, rather than the company itself. The focus of part 2 is getting started and the process of integrating child rights elements into corporate commitments to establish expectations for personnel, suppliers, customers and other business partners. Part 3 outlines the elements that all companies should consider integrating into their human rights and other policies, under Principle 1. It also includes policy recommendations to be considered based on a company’s particular direct and indirect impacts, under Principles 2–10. The information under Principle 4 summarizes when and how companies should develop a stand-alone child protection policy or code of conduct.